SPOILER ALERT! Historic, architecturally diverse Merchant Street in downtown Honolulu has played London, Berlin, New York, Los Angeles… and now you can add Russia to its resume. The production crew set up between Bethel Street and Nuuanu Avenue at 32 Merchant Street — in fact the very same building that houses The Cole Academy (where they filmed a New York scene in October). 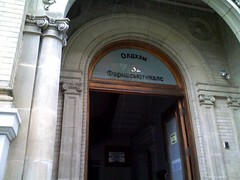 The impressive columned arch doorway got a name, in Russian characters. Fortunately, “LOST” spotter Howard Hsu, who also nabbed this photo, just happened to have a Russian speaking coworker. The name on the building? Oldham Pharmaceuticals. Though apparently “Pharmaceuticals” wasn’t quite written correctly. The scene was for Naveen Andrews, who stalked about dressed all in black (including a leather jacket). Most of the action happened behind closed doors, but the last scene depicted Sayid coming out of the building, holding something inside his jacket, and walking away. Bags of ice were spread across the sidewalk to depict snow. Interestingly, the same thing was done one block east on this same street for another Sayid scene (leaving a restaurant in Berlin). Here, in one take, Andrews slipped a bit on the ice. Not enough to make the blooper reel, unfortunately. After filming wrapped, the production crew made the most of the setup by tossing snowballs at each other. Except they were mostly ice balls, and hit with a palpable thud! Lost was filming here at the Bishop Museum all night tonight 12/10/08. Were in ‘Russia’ at the Red Square. I saw Sayid and the ‘other’ that was caught for awhile(forgot his name). Will try to get some leftover shots after the crew all leaves. Cool! Wow, Howard seems to see all the action on Merchant. Unfortunately I missed Locke too when he was outside the building in October… oh well.